Nov 18, 2006 - than Rs 145,000 crore rupees in the Indian stock market and they have ... of this value, but here log is not used to avoid the negative sign. Does the REIT Stock Market Resemble the General Stock Market? Jun 17, 2011 - To give a specific example, it is clear that Charles Dickens and ..... half to a quarter as large (e.g., O'Brien 20 bp on day t + 1, Pettit -6 bp on. arise in business as well as scientific decision-support appli- cations ... 102 clusters (e.g. âComputers (Hardware)â, âOil and Gasâ, ... First of all, the best clustering. Bernanke and Gertler (2000) estimate a forward looking policy rule aug- ...... era known as the Volcker-Greenspan period) and assessing the importance. efficiencies of the DAX, MDAX, SDAX and ASE indices. By ..... Asia-Pacific Capital Markets School of Economics and Finance, Curtin. University of Technology ... Voit, J. (2001), 'The Statistical Mechanics of Financial Markets', Springer,. Berlin. of the markets, the market as a whole or the price of an individual stock may act ... the bubble usually does occur rapidly as a stock's market price reverts back to,. It is well knownthat stock returnsby themselves achieve respectable R2 's in forecasting investment changes in aggregate data.' If stock returnsareinfectedby sentiment,andif stockreturnspredictinvestment, then perhapssentimentinfluencesinvestment. There is also evidence, however, thatinvestmenthas not alwaysrespondedto sharpmovements in stock prices. Forexample,realinvestmentdidnot seem to rise sharply during the stock market boom in the late 1920s. Nor was there an investmentcollapseafterthe crashof 1987.2It remainsan open question, then, whetherinefficientmarketshave real consequences. In this paper, we try to address empiricallythe broaderquestion of how the stock marketaffects investment. We identifyfour theories that explain the correlationbetween stock returns and subsequent investment. The firstsays thatthe stock marketis a passive predictorof future activity that managersdo not rely on to makeinvestmentdecisions. The second theory says that, in makinginvestmentdecisions, managersrely on the stock marketas a source of information,which may or may not be correctaboutfuturefundamentals.The thirdtheory, whichis perhaps the most common view of the stock market's influence, says that the stock marketaffects investmentthroughits influenceon the cost of funds and external financing. Finally, the fourth theory says that the stock marketexerts pressureon investmentquite aside fromits informational andfinancingrole, because managershave to caterto investors'opinions in orderto protect theirlivelihood. For example, a low stock price may increase the probability of a takeover or a forced removal of top management.If the marketis pessimistic about the firm's profitability, top managementmaybe deterredfrominvestingheavily by the prospect of furthererosion in the stock price. The first theory leaves no room for investor sentimentto influence investment, but the other three theories allow sentiment to influence investmentthroughfalse signals, financingcosts, or marketpressureon managers.Ourempiricalanalysis looks for evidence on whether sentiment affects investment throughthese three channels by investigating whether the component of stock prices that is orthogonal to future economic fundamentalsinfluencesinvestment. 1. See Bosworth (1975), Fama (1981), Fischer and Merton (1984), Barro (1990), Sensenbrenner(1990),andBlanchard,Rhee, andSummers(1990). 2. Barro(1990);Blanchard,Rhee, andSummers(1990). Our tests measure how well the stock market explains investment when we control for the fundamentalvariables both that determine investment and that the stock market might be forecasting. These fundamentalvariablesserve as a proxyfor the profitabilityof investment projectsas well as for the availabilityof internalfunds for investment.3 Essentially,we ask, "Suppose a managerknows the futurefundamental conditions that affect his investment choice. Would the managerstill pay attentionto the stock market? "If the answeris yes, then there is an independentrole for the stock market, and possibly for investor sentiment, in influencinginvestment.The incrementalabilityof stock returns to explaininvestment,whenfuturefundamentalsare held constant,puts an upperbound on the role of investor sentimentthat is orthogonalto fundamentalsin explaininginvestment. For example, suppose that stock prices forecast investment only to the extent thatthey forecastfundamentalfactorsinfluencinginvestment. In this case, that part of stock prices-including possible investor sentiment-that does not help predictfundamentalsalso does not help predict investment. Thus, investor sentiment may affect stock prices independentof future fundamentals,but that influence does not feed throughto investment. If, conversely, the stock markethelps predict investment beyond its ability to predict future fundamentals, then investor sentiment may independentlyinfluence business investment, through the channels of false signals, financing costs, and market pressureon managers. Ouranalysisproceeds in several steps. In the firstsection, we review the evidence and theory behindthe idea that investor sentimentaffects stock prices. In the second section, we describe several views on why the stock marketmightpredictinvestment,and how investor sentiment mightitself influenceinvestmentthroughthe stock market.In the third section, we describe the tests that we use to discover how the stock market influences investment. The fourth and fifth sections present evidenceusingfirm-leveldatafromthe COMPUSTATdatabase bearing on the alternativeviews. 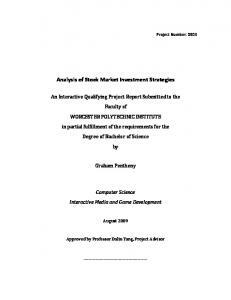 The next two sections turn to the aggregate datathatmost studiesof investmentexamine. The finalsection presents ourconclusions. Investor Sentiment and the Stock Market Since RobertShiller'sdemonstrationof the excess volatilityof stock market prices, research on the efficiency of financial markets has exploded.4In subsequentwork, Shillersuggestedthatfads andfashions, as well as fundamentals, influence asset prices.5 Eugene Fama and KennethFrenchas well as JamesPoterbaandLawrenceSummershave managedto detect mean reversion in U.S. stock returns.6While this evidence is consistent with the presence of mean-revertinginvestor sentimenttowardstocks, it is also consistent with time-varyingrequired returns. Perhaps more compelling evidence on the role of investor sentimentcomes from the studies of the crash of October 1987. Shiller surveyed investors after the crash and found few who thought that fundamentalshadchanged.7Nejat Seyhunfoundthatcorporateinsiders aggressivelyboughtstocks of theirown companiesduringthe crash, and made a lot of money doing SO.8 The insiders quite correctly saw no change in fundamentalsand attributedthe crash to a sentiment shift. The thrustof the evidence is that stock prices respondnot only to news, but also to sentimentchanges. 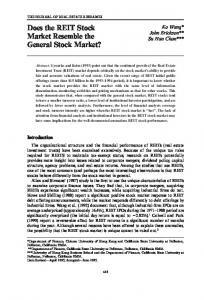 Follow-up studies to the work on mean reversion attempt both to prove the influenceof investor sentimenton stock prices and to isolate measuresof sentiment.Onegroupof studiesconcernsclosed-endmutual funds-funds that issue a fixed numberof shares, and then invest the proceeds in other traded securities. If investors want to liquidatetheir holdings in a closed-end fund, they must sell their shares to other investors, and cannotjust redeem them as in the case of an open-end fund. Closed-end funds are extremely useful in financial economics because it is possible to observe both their net asset value, which is the marketvalue of their stock holdings, and their price, and compare the two. A well-knowncharacteristicof closed-endfunds is that their stock priceis often differentfromtheirnet asset value, suggestingthatmarkets are inefficient. 4. 5. 6. 7. 8. Shiller(1981). Shiller(1984). FamaandFrench(1988);PoterbaandSummers(1988). Shiller(1987). Seyhun(1990). 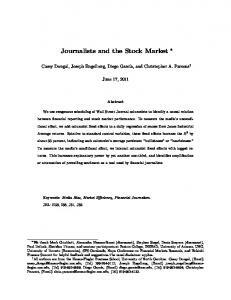 In fact, BradfordDe Long, AndreiShleifer,LawrenceSummers,and Robert Waldmann,following the work of MartinZweig, have argued that the averagediscount on closed-end funds can serve as a proxy for individualinvestorsentiment.9Whenindividualinvestorsarebearishon stocks, they sell closed-end funds as well as other stocks. In doing so, they drive up the discounts on closed-end funds (that is, their price relative to those of the stocks in their portfolio) because institutional investors typically do not trade these funds and so do not offset the bearishnessof individualinvestors. Conversely, when individualsare bullish on stocks, they buy closed-end funds so that discounts narrow or even become premiums.CharlesLee, Andrei Shleifer, and Richard Thalerpresentevidence suggestingthatdiscountsmightindeed serve as a proxyfor individualinvestorsentiment.10We will not reviewthe theory andevidence here, butwilluse closed-endfunddiscountsas one measure of investorsentiment,andwill studytherelationshipsbetweendiscounts, investment,and externalfinancing. The empirical evidence on the potential importance of investor sentimenthas been complementedby a range of theoreticalarguments thatexplainwhy the influenceof sentimenton stock prices would not be eliminatedthrough"arbitrage. "Arbitragein this context does not refer to riskless arbitrage,as understoodin financialeconomics, but ratherto risky, contrarianstrategies whereby smart investors bet against the mispricing.StephenFiglewskiand RobertShillerhave both pointedout that when stock returnsare risky, arbitrageof this sort is also risky and thereforenot completelyeffective. "IFor example, if an arbitrageurbuys underpricedstocks, he runs the risk that fundamentalnews will be bad andthathe will take a bathon whathadinitiallybeen an attractivetrade. Because arbitrageis risky, arbitrageurswill limitthe size of theirtrades, and investor sentiment will have an effect on prices in equilibrium. Othershave takenthis argumentfurther.12 They pointout thatif investor sentimentis itself stochastic, it adds furtherrisk to arbitragebecause sentiment can turn against an arbitrageurwith a short horizon. An arbitrageurbuying underpricedstocks runs the risk that they become even more underpricedin the near future, when they mighthave to be 9. De Longandothers(1990);Zweig(1973). 10. Lee, Shleifer,andThaler(1990). 11. Figlewski(1979);Shiller(1984). 12. De Longandothers(1990). sold. This noise-traderrisk makes arbitrageeven riskier, allowing the effects of sentimenton prices to be even more pronounced.The upshot of these models is that the theoreticalargumentthat arbitrageprevents investor sentimentfrominfluencingprices is simplywrong. Most models of investor sentimentdeal with sentiment that affects the whole stock marketor at least a big chunk of it. When sentiment affects a large number of securities, leaning against the wind means bearing systematic risk, and is therefore costly to risk-aversearbitrageurs. If, in contrast, sentiment affects only a few securities, betting againstit meansbearingonly theriskthatcanbe diversified,andtherefore arbitrageurswill bet more aggressively. Thus, investor sentiment can have a pronouncedeffect on prices only when it affects a large number of securities. This conclusion holds in a perfect capital market, with no trading restrictions or costs of becoming informed about the mispricing of securities. More realisticallythough, arbitrageis a costly activity and arbitrageresourceswill be devoted to particularsecuritiesonly if returns justify bearingthe costs. As a result,investorsentimenttowardindividual securitieswill not be arbitragedaway andwill affecttheirprices, because arbitrageurs'fundsandpatienceare limited.If a stock is mispriced,only a few arbitrageurswouldknow aboutit. 13Those who do know may have alternativeuses for funds, or may not wait until the mispricingdisappears.14 Waitingis especially costly when arbitragerequires selling a securityshort, and regulationsdo not give the short seller full use of the proceeds. Moreover,takinga largeposition in a securitymeans bearing a large amount of idiosyncraticrisk, which is costly to an arbitrageur who is not fully diversified. Finally, as stressed by Fischer Black, arbitrageursoften cannotbe certainhow mispriceda securityis, further limitingtheir willingnessto tradein it.15 All these costs suggest that the resources leaningagainstthe mispricingof any given security are quite limited, and, therefore, even idiosyncratic investor sentiment may influenceshareprices. To conclude, recent research has produced a variety of empirical evidence suggestingthat investor sentimentinfluences asset prices. A parallel research effort has demonstrated that the usual models in 13. Merton(1987). 14. Shleiferand Vishny(1990). 15. Black(1986). financial economics, in which investors are risk averse, imply that investor sentimentshould affect prices. The argumentthat marketwide investor sentiment affects prices is particularlystrong, but one also expects firm-specificsentimentto affect individualstocks. These theories and evidence raise the obvious question:does the effect of investor sentimenton stock pricesfeed throughto businessinvestmentspending? To address this question, we first review how stock prices affect investmentin general. The active informanthypothesis assigns a greaterrole to the stock market.It says thatstock pricespredictinvestmentbecausethey convey to managersinformationuseful in makinginvestment decisions. This informationcan accurately,or inaccurately,predictfundamentals.Even when the stock marketis the best availablepredictor,it can err due to the inherent unpredictabilityof the fundamentals, or because stock prices are contaminatedby sentiment that managerscannot separate from informationabout fundamentals.Even if the stock marketsends an inaccuratesignal, the informationmay still be used and so the stock returnwill influenceinvestment. The market can convey a variety of informationthat bears on the intrinsicuncertaintyfacinga firm-such as futureaggregateor individual demand.Alternatively,the marketcan reveal investors' assessment of the competence of a firm's managersand their ability to make good 16. Seyhun (1986, 1988). Accordingto the two previous hypotheses, the stock market'smain role is to convey information:in the firstcase to the econometrician,and in the second case to the manager.The next two views assign the stock marketa more active role. Many people believe that the stock market plays a key role in helpingfirmsraise capital.This applies to new firms, in the case of initialpublicofferings(IPOs),andto more seasoned firms. The valuationthatthe marketassigns to a company'sequitydetermines the cost of capitalto thatcompany,a pointmadeby StanleyFischerand RobertMertonamongothers.17 The higherthe valuation,the cheaperis the equity. When the stock market is efficient, firms cannot find a particularlyadvantageoustime to undertakeequity finance. However, when the stock marketis subjectto investorsentiment,firmscan choose equity finance when the marketovervalues them, makingthe cost of capitalirrationallylow. As pointedout by OlivierBlanchard,ChangyongRhee, andLawrence Summers,in a sentiment-infectedstock market,rationalmanagersmight not invest the proceeds from a new share issue. '8 Fischer and Merton presumethat firmsfor which funds are irrationallycheap will invest in marginalprojects.At a rationalcost of funds, these projectswould have a negativenet presentvalue.19Blanchard,Rhee, and Summerspointout that firmsinstead may issue the overvaluedequity and then invest the proceeds in financial securities, which are zero net-present-valueinvestments, ratherthan in negative net-present-valueprojects. In other words, firmsissue equity when equity is overpriced, but issue debt or financeinternallywhen equity is not overpriced;investmentis the same in either case. The Blanchard-Rhee-Summers view implies that even if 17. FischerandMerton(1984). 18. Blanchard,Rhee, andSummers(1990). 19. FischerandMerton(1984). Even withoutconveyingany informationto the managers,or affecting the cost of securityissues, the stock marketcan influenceinvestmentby exerting pressure on managers. For example, if investors dislike oil companies and drive down the prices of their shares, then, for fear of beingfiredortakenover, managersof oil companiesmighttryto disinvest and diversify, even if furtherinvestment in oil is profitable.If market participantsvote theirsentimentby sellingand buyingstocks, and if the hiringandfiringof managersis tied to the performanceof the stock, then these votes will affect investmenteven if they are uninformed. Oneparticularversionof this hypothesisis the shorthorizonstheory.20 When arbitragefunds are limited, smartinvestors are reluctantto buy andholdunderpriced,long-terminvestmentprojectsbecausemispricing takes a long time to be corrected.2'Managerswho are averse to low stock prices, for fear of being firedor taken over, will avoid these longterminvestmentseven if these projectshave a positive net presentvalue. Thus, investor sentimentcan affect investment. The crucialimplicationhere is that the stock markethas an influence on investmentbeyond its influencethroughfinancingcosts and beyond its abilityto predictfuturefundamentals.After controllingfor financing costs andfundamentals,the stock marketstill affects investment.In this respect, the marketpressurehypothesisresemblesthe faulty informant version of the active predictorhypothesis. The main difference is that false signals are most likely to be listened to when they come from the aggregate market, but are unlikely to influence an individual firm's managerswhen they are idiosyncratic. In contrast, while the market pressurehypothesismayapplyon the aggregatelevel, it is most plausible at the individualfirmlevel. Therefore,the findingof a residualrole for the stock marketwould have differentinterpretationsin aggregateand cross-sectionalregressions. 20. Stein (1988); Shleifer and Vishny (1990). 21. Shleifer and Vishny (1990). Empirical Design The empiricalapproachtakenin this paperis somewhatatheoretical. We use a fairlyunstructuredapproach,placingfew restrictionson how stock returns enter the investment equations in order to allow the maximum scope for the stock market to affect investment. For our analysis, we regressinvestmentgrowthon stock returnsandthe growth in fundamentalvariablesin orderto see how importantthe stock market is after controllingfor fundamentals.The idea of these regressionsis to ask, "If managersknew futurefundamentals,would orthogonalmovements in shareprice still help predicttheirinvestmentdecisions?" We do not attemptto estimateconsistentlythe structuralparameters of the investment and financingequations, as we are not preparedto makethe necessary identifyingassumptions.Realizingthatinvestment, financing,and fundamentalsare all simultaneouslydetermined,we still wish to interpretour quasi-reduced-formresults as evidence on a more narrowquestion-the incrementalexplanatorypower of the stock market in predictinginvestment. Even with this more modest objective in mind, our interpretationof the evidence still rests on several key assumptionsdiscussed below. To identifythe role of investor sentiment,we focus on the merits of the faulty informant,financing,and marketpressureviews of the stock market,withthe caveat thatthe faultyinformantview makesmore sense in aggregate data than in cross-sectional data.22The financing view predictsthatthe mainlinkfromthe stock marketto investmentis through financing;therefore, we examine financingdata to evaluate this view. Our tests of the faulty informantand market pressure views are less direct. Essentially, these views maintainthat the stock marketplays an independentrole in predicting investment beyond the informationit providesabout futurefundamentalsand beyond its effect on financing. It is importantto stress that we can never reject the null hypothesisthat investorsentimentdoes not affect investmentthroughthe stock market. 22. Because the accurate active informantview involves perfectly correct signals about future fundamentals,there is no room for the irrationalinfluence of investor sentiment.This hypothesis,therefore,is irrelevantto this discussion.We also ignorefor the time being the passive informantview because in it the stock market,and thereby investorsentiment,do not influenceinvestment. where Al, is the investmentgrowthrate in year t, AF, is the growthrate of fundamentals-cash flow and sales-in year t, R,_ 1is the stock return in year t - 1, and AN, is the form of financingin year t, which includes debt,and equity issues.23Like most researchers,we run all our regressions in changes rather than levels because residuals in the levels regressionsare serially correlated.For example, in the firm-leveldata the "fixed effect" is the dominant influence in the investment-level equations,andone gets little informationaboutwhatdrivesyear-to-year changes in investment from these equations. Moreover, the crosssectionalrelationbetweenthefixedeffect andthefundamentalsproduces some perverse results, with nothingbut industryhavingmuch explanatory power. The financinghypothesis says that addingfinancingvariablesshould helpexplainthe variationin investment.The coefficientson the financing variablesin equation3 shouldbe significantandlarge,andthe incremental R2, as we move from equation 1 to equation 3, should be large. Moreover,if financingreallyis the mainchannelthroughwhichthe stock marketaffects investment, then moving from equation 3 to equation4 shouldproducean insignificantcoefficienton the laggedmarketreturn, and shouldcertainlynot raise the R2much. Finally, if the financingview is important, then, as we move from equation 2 to equation 4, the coefficient on the lagged return should fall, since the sensitivity of investmentto returnshouldbe reducedonce the financingvariablesare includedin the regression. The faulty informantand marketpressurehypotheses say that stock returnsshould help explain investment beyond their ability to predict 23. A slightlyricherlag structureis allowedfor in the aggregatedata. the firm'sfundamentalconditionsandbeyondtheirimpacton financing. If so, the coefficienton R,_ shouldbe significantin equation2, and the R2 in equation2 should be much largerthan in equation 1. Also, when we controlfor financingas well as for fundamentals,the returnvariable in equation4 should be significantand the incrementalR2 in equation4 relativeto equation3 shouldbe large. If the stock returnhas significant explanatorypower for investment beyond its effect on fundamentals andfinancing,marketsentimentvery possibly influencesinvestment. Of course, we may not have specifiedthe full set of fundamentals.In that case, the stock marketmattersonly to the extent that we have an omittedvariable,and the role of investor sentimentmay evaporatewith its inclusion. That is, the stock marketmay prove an "accuratepassive informant"even if we find that equation 4 explains investment much betterthanequation3. Ourexercise is still useful, however, because the incrementalR2, as we movefromequation3 to equation4, is an estimated upperboundon how muchof the variationin investmentcanbe explained by sentiment.A small incrementalR2 implies that investor sentimentis probablynot very important.If the R2 is large, the presumptionthat sentimentis importantgains strength. This approach raises several conceptual issues. First, our market value variableis a stock returnratherthana changein q, the ratioof the firm'smarketvalue to replacementcost.24Since both the capital stock and the marketvalue of debt move much more slowly than the market value of equity, the practicaldifferencebetween using stock returnsand changes in q is fairly small. 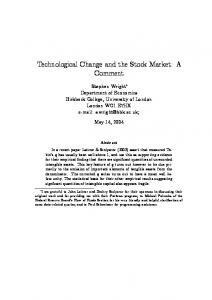 Robert Barro conducts an empiricalrace between these approaches,and finds that the data favor stock returns over changes in q.25 He attributesthis findingto the fact that the capital stock is measuredwith error.Because we are interestedin allowingthe maximumscope for the stock market to predict investment, we use returnsratherthanchangesin q in our analysis. Second, by focusing only on the incrementalexplanatorypower of stockreturns,we mayunderestimatethe scope for sentimentto influence investment. Because sales, cash flow, and investment are all simultaneouslydetermined,some of the investmentvariationexplainedby sales may actually be driven by stock returns. For example, suppose that a 24. Since Brainardand Tobin(1968)firstused q, manyothers have followed in their steps-Blanchard, Rhee, and Summers(1990),Hayashi(1982),and Summers(1981). 25. Barro(1990). good stock return raises investment, which in turn improves sales throughlargercapacity or lower variable costs. Controllingfor sales, we mightfindonly a smalleffect of the stock returnon investment,even whenthe trueeffect is large.We arguebelow thatthe datado not support this view, andassumethat, at least over ourone- to three-yearestimation period, stock returnsare not an importantdrivingforce behindthe sales process. A relatedconcernis that investor sentimentis sometimesconsidered an overreactionto fundamentalnews. In fact, some recent evidence on stock returnssuggests that fads and fundamentalsare positively correlated.26If so, we may be underestimatingthe explanatory power of investor sentiment, because our tests focus only on its incremental explanatorypowerover andabove fundamentals.The powerof ourtests will be particularlylow if the stock marketoverreacts to fundamentals in a uniformfashion across all firmsat all times. If this is not the case, however, our tests should detect some of the effects of overreaction. Our only goal is to calibrate the role of investor sentiment that is orthogonalto fundamentals. A finalconceptualissue is how to measurethe importanceof sentiment in explaining investment. Focusing on the incremental R2 and the parameterestimate on stock returns,we pretty much ignore t-statistics in the firm-levelregressions.We do so because most variablesare highly significantwith severalthousandobservations.The t-statisticswill play a largerrole in our discussion of the aggregatetime series evidence. We do not rely on R2 to choose between two specifications on a statisticalbasis. Ratherwe use incrementalR2'sto gaugethe fractionof all investment variationthat is conceivably due to investor sentiment. Because investment is extraordinarilyvolatile, especially at the firm level, even fairly large regression estimates of the marginaleffect of stock returnsmay not explain much of the variationin investment. A largecoefficienton stock prices indicatesthatthe stock marketcan help predict significantchanges in investment. Yet, if the incrementalR2 is low, an irrationalstock marketis an unlikelycause of widespreadunderor overinvestmentin many sectors of the economy, since stock market behaviorhelpspredictonly a smallfractionof the variationin investment. 26. BarskyandDe Long (1989);Campbelland Kyle (1988). Evidence from Firm-Level Data Most of the recent empiricalwork on the ability of stock returnsto forecastinvestmenthas focused on aggregatedata. Yet we would argue that cross-sectional data are equally important.The distortion of the allocation of capital across firms that could arise from deviant share prices may be a greatersource of harmthanthe false signalsthat distort aggregate investment. Investment variation over the business cycle caused by false signals from the stock market largely amounts to intertemporalsubstitutionof investment.Misallocationof capitalacross sectors, however, can lead to more permanentdamage, as socialist economiesillustrate.Also, it seems likelythatthe stock marketallocates investmentacross sectors and firmsthroughrelative shareprices more than it allocates investment over time throughthe variationin returns over time. We thereforebegin by examiningthe relationshipbetween relativestock returnsand investment. Our main empiricalresults are based on the analysis of annualdata from the COMPUSTATdata base between 1960and 1987.The sample was constructedby Bronwyn Hall.27Because the coverage of firmsby COMPUSTAThas expandedgreatly over time, we have only 93 firms in 1960,risingto 1,032firmsin 1987.The sources andconstructionof all the dataare describedin the appendix. The investment variable we use is the growth rate of real capital expendituresexcludingacquisitions.The two measuresof fundamentals are the growth rates of sales and cash flow, which we believe are the most importantfundamentaldeterminantsof investment. We use sales growthas a measureof fundamentalsbecause it reflectsfuturedemand for the firm'sproductsand serves as a measureof investmentprofitability. Cash flow measures fundamentalsboth because it reflects current (andpresumablyfuture)profitabilityandbecauseitfacilitatesinvestment if a firmis constrainedin the capitalmarket.28Ourcash flow variableis after-taxcorporateprofits(net of interestpayments)plus depreciation, and therefore closely approximatesthe inflow of funds available for investment. We have also experimentedwith other proxies, such as 27. Cummins,Hall, Laderman,and Mundy(1988). 28. Fazzari,Hubbard,andPetersen(1988). Because we arelookingat a cross-sectionof firms,we computecapital asset pricingmodel (CAPM)alphas(abnormalreturns)for all firms.We do that by regressingeach firm's returns net of Treasury bill (T-bill) returnson the returnof the value-weightedmarketindex net of the Tbill return, using monthly data for the whole sample period. The regression coefficient on market return is the firm's beta, which is assumed to be constant duringthe whole period. We then define alpha as the residualin the regressionfor each firm. In a given year, alpha is the firm'sexcess stock returnin that year, where returnsare cumulated exponentially. If the CAPM is an inappropriatemodel for generating expected returns,our alphasmay compensatefor risks thatare not allowedfor by the CAPM. In that case, a high alpha may be due to a high expected 29. Theoretically,it is not clearwhetherchangesin investmentshouldbe predictedby the level of issuingactivity or by the changes in issuingactivity. Using changeshas the problemthat changes are negative after a large issue. The explanatorypower of the specificationin changesis also inferiorto thatin levels. Source: COMPUSTAT data base and Center for Research in Security Prices (CRSP) data base, at the Graduate School, University of Chicago. a. The sample for the annual analysis has 27,771 observations. b. Investment is defined as "capital expenditures" from annual statement of changes in financial position, from COMPUSTAT, including COMPUSTAT Research File, 1959-87. c. Alpha is the lagged abnormal stock returns. CAPM betas were estimated for each firm using all available monthly returns from CRSP, 1959-87. These betas were then used to calculate an alpha for each year. d. Cash flow equals net income plus depreciation. e. New share issue is the sale of common equity divided by the total market value of common equity at the beginning of the year, from COMPUSTAT, 1971-87. Where the above data were unavailable, including the years 1959-70, sale of common equity was estimated from the change in the number of shares outstanding reported in CRSP, filtering out changes due to liquidation, rights offering, stock splits, or stock dividends. f. New debt issues is the change in book debt divided by the lagged value of book debt. g. The sample for the three-year analysis has 7,950 observations. The basic regressions for nonoverlappingthree-year periods are presented in table 2. In these regressions, we use contemporaneous fundamentals,financingvariables, and stock returns (representedby alpha)lagged one year. That is, we measure investment growth from year t to year t + 3 and the stock returnfrom year t - 1 to year t + 2. All equationsare estimatedusing a dummyvariablefor each three-year time period. We have also estimated these regressions using industryperiod dummies. The results are not qualitatively different, but the 30. Inregressionsrunusingannualdata,we foundextremelylowR2's even inequations includingboth the stock returnsand fundamentalvariables.For this reason, we proceed to the three-yearregressions. .. 0.155 (4.3) 0.123 (3.5) 0.133 (3.7) . . . Source: Authors' own calculations using COMPUSTAT and CRSP data bases with 7,950 observations from 196387. See table 1 for an explanation of variables. The numbers in parentheses are t-statistics. investmentover three years; a 10percentgrowthin cash flow leads to a 1.8percentgrowthin investment. Equation 2.3 represents one test of the hypothesis that the stock marketinfluencesinvestmentbeyond its abilityto predictfuturefundamentals, since the equation includes contemporaneousfundamentals togetherwith the lagged stock return.Not surprisingly,the coefficient on alphadropsby about40 percentfrom its level in equation2.1. When futurefundamentalsare held constant,the responsivenessof investment to lagged stock returnsis significantlysmaller. The incrementalR2 of equation 2.3 is only 3.8 percent relative to that of equation 2.2. The lagged abnormalreturn explains only 3.8 percent of the variation in investmentbeyond what can be explainedby fundamentals.This incrementalR2is an estimatedupperboundon how muchinvestor sentiment toward individual stocks can affect investment.3' Presumably, if we could measure and include other fundamentaldeterminantsof investmentin the regression,the incrementalR2wouldbe even smaller.Simply by includingthe availablecrude measuresof fundamentals,we can cut down the incrementalexplanatorypower of relative stock returns by morethan70 percent,whichseems to indicatethattheirabilityto predict investmentis largelybasedon theircorrelationwithfuturefundamentals. The comparisonof equations2.2 and2.3 illustratesthe generalfinding of this paper.The coefficienton the abnormalreturn,controllingfor the fundamentals,is both statistically and economically significant.A 30 percent abnormalstock returnover three years, which is large but not unusual,is associated with a 10percentextragrowthin investmentover three years. So high stock returnsindeed predict high investment. At the same time, because investment is so volatile, the incremental explanatorypower of the stock marketis typically small;in this case it is only 3.8 percent. Thus, variationin relative marketvaluationacross firmsandsectors cannotaccountfor muchof the variationin investment. Althoughequation2.3 shows thatlaggedstock returnsdo not explain muchof the variationin investment,it does not distinguishbetween the 31. This interpretationdependson ourtreatingthe fundamentalsfromequation2.2 as the primaryexplanatoryvariables.Absentthese priors,it wouldbejust as appropriateto interpretthe incrementalR2whenfundamentalsare addedto equation2.1 as the independent contributionof the fundamentals.This would leave the upper bound on possible independenteffects fromstock pricesandinvestorsentimentuncertain. determinantsof investment have been left out of the regression. We have triedaddingfurthermeasures of fundamentals,such as more lags on cash flow and sales growth, but these do not seem to help explain investmentor reducethe explanatorypower of returns. Thereare also reasons why the stock marketmay be more important thanwe estimate. First, we may have used the wronglag structure-the stock market may anticipate investment at either a longer or shorter horizonthanwe specifiedin table 2. We have experimentedwith several alternativelag structures. When the stock returnis contemporaneous with the fundamentals, using alpha from t to t + 3 rather than t - 1 to t + 2, the R2 for equation2.1 is 0.12, and for equation2.3 is 0.23. We have also allowed for returnsto be measuredover a longerperiod and with longer lags, but the incrementalR2 for the stock returnis always lower than in table 2. Anotherpossibility is to break up the three-year returninto its componentparts so that the returnfrom t - 1 to t + 2 is replaced by the returns from t - 1 to t, from t to t + 1, and from t + 1 to t + 2. This changeactuallydoes raise the explanatorypower of stock returns,but only slightly;the R2 in the analogof equation2.3 rises by a small amount. None of our alternative specifications of the effect of relative stock returnson investment has noticeably more explanatory powerthanthe one we reportin table 2. Second, we may have underestimatedthe effect of the stock market by focusing only on relative stock returns and by using time-period dummiesinsteadof the returnon the aggregatestock marketover time. We discuss the effects of the aggregatestock marketat a later point in the paper. Here we reportwhat happenswhen we substitutethe return on the value-weightedstock marketfor time dummies.32The marginal explanatorypower of the aggregatestock returnin these equations is quitelow. The R2 in equation2.3, without time dummies,rises by only 0.2 percentwhen the aggregatestock marketis addedto the regression. This findingmakes sense if variationin investmentgrowth in response to idiosyncraticfactors accounts for most of the variationof investment in the pooled time-series/cross-sectiondata. As we discussed above, we are also concerned that stock returns drivethe sales-cash flow process and that the effect of stock returnsis thereforelargerthan the effect impliedby its incrementalexplanatory 32. Weuse the value-weightedindexdevelopedby the CenterforResearchin Security Prices(CRSP)at the Universityof Chicago. 0.218 (2.6) 0.158 (1.9) 0.175 (2.1) . . .
0.459 (6.4) 0.449 (6.4) .. . Source: Authors' own calculations using COMPUSTAT and CRSP data bases with 2,042 observations every third year from 1963-87. See table I for a description of the variables. The numbers in parentheses are t-statistics. a. A firm is classified as "small" if it falls in the bottom quintile of all COMPUSTAT firms in terms of the market value of equity the first year it entered the survey. sample, indicating the greater relative sensitivity of investment to externalfinancingfor "small" firms.Financingvariablesadd 2 percent to the R2, adding relative stock returns adds another 2 percent. For "small" firms,as for the whole sample, the faulty informant,financing, and marketpressure views of the stock markethelp explain the data, but not a lot. As in the whole sample, most of the explanatorypower of financingcomes from debt issues. A final test concerns the marketpressure view of the stock market and investment. It has been arguedthat recently the stock markethas become a harsherjudge of managerialperformance,with the takeover wave of the 1980s being a manifestationof its new role. The short horizonsof corporatemanagersreflectthese stock marketpressures. If these views are correct, the sensitivity of investment to stock returns should have increasedin the 1980s,and the coefficienton alphain later years should be higher. We have tested this propositionand found no evidence to support this idea. There is no trend in the coefficient on alphaor in its marginalexplanatorypower over our sampleperiod. Source: Authors'own calculationsusing COMPUSTATand CRSP data bases. See table I for descriptionof variables.The numbersin parentheses(bottompanel)are t-statistics.Given percentilesof alphaare chosen for illustration;othervariablesare evaluatedat theirmediansin equations4.1 and 4.2. Source: Authors'own calculationsusing COMPUSTATand CRSPdata bases. Regressionsincludetime-period effects. The numbersin parenthesesare t-statistics. a. The ratiois betweenthe dollarproceedsfromdebt and equityissues madebetweentime t and t - 3 and the sum of investmentsmade between time t - 5 and t - 2. Alphais from t - 5 to t - 2 and sales and cash flow growthare fromt - 3 to t.
bound for the explanatory power of stock returns in the investment equations. At the same time, financing can plausibly account for a significant part of the explanatory power of stock returns in the investment equations. The residual component could be due to market pressure or faulty informant effects or to the ability of stock returns to explain fundamentals that are not captured by our simple sales and cash flow measures. Taken together, the investment and the financing evidence do not leave much room for the influence of investor sentiment. External financing is not sufficiently sensitive to stock returns, and investment is not well explained by external financing. It is hard to explain much of the variation in investment through investor sentiment. marketwide returns. That is, if equity finance responds to extreme overpricingof equities, we shouldsee a largeeffect from the alphas. On the other hand, theories of fads, such as those of Shillerand De Long and others, suggest that investor sentiment is likely to be more pronounced in the aggregate data.33The issue is largely empirical. We thereforetest the influenceof the stockmarketon investmentinaggregate data. The appendixdescribesthe datawe use on investment,fundamentals, andfinancing.The fundamentalsthatmost clearlyparallelthe ones used inthe firm-leveldataarecash flow(after-taxcorporateprofitsplus capital consumption)and personal consumption expenditure. Personal consumptionexpenditureon durables,nondurables,and services seems to be the appropriatemeasureof final sales in the economy, which is our proxy for the growthof demand. Ourinvestmentvariableis fixed nonresidentialinvestment, which excludes inventory investment. We use annualdata on most variablesfrom 1935-88, excludingthe war period 1942-46as suggested by Robert Gordon.34We exclude the early 1930s because corporate profits were negative in some of these years. Our equityfinancevariableis aggregatedover all equity issues by all firmsin the datadevelopedby the CenterforResearchin SecurityPrices(CRSP). The debt financevariableis from the Federal Reserve. Unfortunately, this variablestartsin 1952;therefore,we rerunsome of the regressions startingin 1952to utilize debt financingdata. An interestrate variable, the lagged change in yield on AAA corporatebonds, was also tried in the list of fundamentals,but came in with the wrongsign and borderline significance.The variablewas dropped. As before, all regressions are estimatedin changesratherthanlevels. Unlike the firm-level data, we have found that two lags of stock returnsas well as contemporaneousandlaggedchangesin fundamentals help explain investmentgrowthin the aggregatedata. Accordingly,we have adjustedthe aggregatespecificationsto have one- and two-year lagged stock returns,as well as contemporaneousand laggedgrowthof consumptionand cash flow. In addition,we allow for contemporaneous andone-yearlaggedeffects fromthe financingvariables.Typically,only the one-yearlag is significantfor the equity issues variable,while for the 33. Shiller(1984);De Long andothers(1990). 34. Gordon(1986). Watson demonstratethat, as a leading indicatorof output, the stock marketis dominatedby a combinationof other fundamentalvariables, includinginterestrates.35This findingmeans that managersdo not need the stock marketto make investment decisions when they have other fundamentaldata;if most explanatorypowercomes fromfundamentals, and managers do not need the stock market to predict them, then managersdo not need the stock marketto make investmentdecisions. This argumentfavors the passive informantview of the stock market. An importantexception is the sunspotversionof the active informant view. If the stock marketinformsinvestors and managersabout which equilibriumis at work, the marketdeterminesboth futureconsumption and investment. In this case, the stock marketstill plays an active role, even thoughit does not help predictinvestmentgrowthaftercontrolling for consumptiongrowth. Our data do not enable us to distinguishthe sunspotactive informantmodelfrom the passive informantmodel. The resultsin table 6 suggestthatthe role of the stock market,beyond its ability to predict fundamentals,is limited. Nonetheless, we try to evaluate how well financingexplains investment. As noted above, our equityfinancingvariabledoes not explainmuch. As for debt finance,we must look at the post-1952 sample. Table 7 reports the results for the post-1952period. For this period, the R2 for stock returnsalone is 31.0 percent, thatfor fundamentalsalone is 67.4 percent.The incrementalR2 for the market,after controllingfor fundamentals,is a much higher7.3 percent,which may meanmoreroomfor investorsentimentto influence investment. Equation7.4 shows that when the equity issues variableis included in an equationwith the fundamentals,it adds 2.6 percentto the R2 and is positiveand nearlysignificant.When 10percentmorefirmsissue equity in excess of 5 percent, investmentgrows on average 1.5 percentfaster. The debt issue variablealone adds 3.8 percentto the R2 and is negative and statisticallysignificant.Debt financingis high when investment is slowingdown. Debt seems to be used to smooth investmentso that in a recession, when cash flow falls sharply, investment does not fall as sharply.The signon debt financeis differentfromthatin firm-leveldata, which can be explained if debt is used to smooth cyclical variationin investmentbut not idiosyncraticvariationin investment.Together,the stock issue and debt financingvariableshave an incrementalR2 of 9.5 35. Stock and Watson (1990). ,c; - tJ - - m - D m .
Source: Authors' own calculations using U.S. Department of Commerce data and the CRSP data base. The sample includes 28 observations. The numbers in parentheses are t-statistics. a. Stock index is the exponentially detrended level of the real CRSP value-weighted stock market index. b. The level of discount on closed-end funds is the year-end average discount on a portfolio of closed-end funds, from Lee, Shleifer, and Thaler (1990) for 1965-85, using a portfolio of 18 funds. For 1930-64 and 1986-89, five funds are used: Adams Express, General American, Lehman, Niagara Shares, and Tricontinental. c. Corporate profits and consumption are described in table 6. Here, as in table 8, we use two-year growth in profits and consumption as the independent variable. strengthof our conclusions is limited by the short time series we have on IPOs. bit. Second, in episodes such as the late 1920sand post-October 1987 corporatemanagershave largely ignored this sunspot. Overall, a fair readingof the evidence is that the stock marketis a sometimes faulty predictorof the future, which does not receive muchattentionand does not influenceaggregateinvestment. An importantexception to this findingis the evidence fromthe initial publicofferingsdata,whereboththe stock marketindexandthe discount on closed-endfundshelppredictthepace of new offerings.Thisevidence, thoughlimitedby the lack of data, suggests that in the marketfor new issues, the stock marketand investor sentimentmatter.It could still be that market conditions affect only the timing of IPOs, and not their volume over time. On the other hand, it could be that in low markets good ideas die because they cannot be financed.The effect of investor sentiment on the new issues market is an importantarea for further research. Description of Data THE APPENDIX we describe the sources of our data and the methods used to calculateour variables. Firm-Level Data Investment:"Capitalexpenditures"arefromannualstatementof changes in financialposition, from COMPUSTATdata base, 1959-87, including COMPUSTATResearch File; acquisitions are not included;observations with growthrates above 1,000percentare excluded as outliersfor this and all the other variables. Sales: FromCOMPUSTAT,1959-87. Cashflow: Net income plus depreciation,from COMPUSTAT, 195987. Net debt issues: ABook debt, divided by book debt, I, from COMPUSTAT, 1959-87. New share issues: Sale of common equity divided by the beginning-ofyear total marketvalue of common equity, from COMPUSTAT,197187; where above was missing, includingbetween 1959and 1970,sale of common equity is estimated from change in the number of shares outstandingreportedin CRSP, filteringout changes due to liquidation, rightsoffering,stock splits, or stock dividends. Alpha: CAPM betas were estimated for each firm using all available monthlyreturns.These betas were then used to calculate an alphafor each year. Data are from CRSP, 1959-87. Aggregate Data Investment:FromU.S. Departmentof Commerce,"GrossPrivateFixed Investment, Non-residential";the series is the sum of investment in nonresidentialstructuresand equipmentfor 1935-41and 1947-88. Consumption:Aggregatepersonalconsumption(includingnondurables, durables,and services) from the U.S. Departmentof Commerce, 193441 and 1947-88. Cashflow: After-taxtotal corporateprofits (withoutdepreciationsubtracted)from U.S. Departmentof Commerce, 1934-41and 1947-88. New debt issues: The ratio of net funds raisedfrom corporatebonds to total outstandingliabilities,obtainedfrom sector statementsof savings and investmentfor nonfinancialcorporatebusiness; from Federal Reserve, 1952-89. New share issues: Individualfirm share issues were calculated using CRSP data as described above. Aggregate variable is the fraction of firmsincreasingthe numberof sharesby more than 5 percentin a given year. Stock return: Value-weightedindex return from CRSP, 1933-41 and 1947-88. Closed-endfund discount:Year-endaveragediscount on a portfolioof closed-end funds; from Lee, Shleifer, and Thalerfor 1965-85, using a portfolioof 18funds;for 1930-64a portfolioof five fundsis used (Adams Express, GeneralAmerican,Lehman,NiagaraShares,andTricontinental);the same five funds also used for 1986-89. GNP deflator.One exception is aggregateinvestment,which is deflated by the U.S. Departmentof Commerce'simplicitpricedeflatorup to 1982 and by the "chain investment index," suggested by Gordonfor 198388. Also, aggregatepersonal consumptionis deflatedby implicitprice deflatorfor personalconsumptionexpenditures. Comments and Discussion Matthew Shapiro: The stock market and investment are positively correlated. This well-known empirical finding provides the point of departurefor the authors'theoreticaldiscussion. In it, they provide an interesting and useful classification scheme for explanations of this correlation.For the most part,they put aside the questionof whetheror notthe stockmarketis efficientinthe sense thatit appropriatelydiscounts futurecash flows. Insteadthey ask a moreinterestingquestion.Namely, do the fundamentals, specifically the accumulation of fixed capital, respond to movements in the stock market?Of course, the extent to whichinvestmentrespondsto the stock marketdependson the efficiency of the stock market.The authors'theoreticalsection clearly addresses this simultaneity. Most economists thinkof the relationshipbetween the stock market and investmentin terms of q, the ratio of marketvalue to replacement cost. JohnMaynardKeynes viewed stock marketfluctuationsas largely irrationaland hence not useful signals about the profitabilityof investment projects. In WilliamBrainardand James Tobin's formalizationof Keynes's chapter12,managersreactto potentiallyirrationalmovements in the marketby financingexpansioneitherthroughnew issues, when q exceeds one, or throughmergersand acquisitions, when q is less than one.' Andrew Abel's and Fumio Hayashi's derivationsof q-theoretic models of investmentimplicitlyassume rationalstock marketvaluation to the extent that the shadow value of the fixity of capitalis associated with financialvariables.2Under certain assumptions, their q-theoretic models are observationallyequivalentto Brainardand Tobin's. But in 1. Brainard and Tobin (1968). 2. Abel (1979); Hayashi (1982). these derivations, q diverges from one only because adjustmentcosts keep the actual capital stock from equalingits desired level. The stock marketappropriatelyreflectsthis out-of-steady-stateoutcome.3 RandallMorck, Andrei Shleifer, and Robert Vishny do not use q to discuss the relationship between the stock market and investment. Nonetheless, their lucid theoretical discussion clarifies how the stock market's decision to rationally discount future cash flow affects the correlation.The authorsconsiderfourhypotheses. One of theirhypothesis, which is closely relatedto the Keynes-Brainard-Tobin q-model, is that the market is irrational,but managersuse its swings to finance investment.In anotherhypothesis, the managersof firmsactuallylearn about the profitabilityof their investmentsfrom the stock market.In a third, the managershave superior informationabout their profits, so they do not learnfrom the market,but the econometriciangets a signal about profitabilityfrom the stock market.These latter two hypotheses maintainthat the stock marketis rational;both hypotheses are related to adjustment-costbased implementationsof the q-theoreticmodels, but the signaling hypothesis is closest to Abel's and Hayashi's models. Finally, the authorsconsidera fourthhypothesis-that the investmentstock market correlationarises because managerstry to increase reportedprofitsby curtailinginvestmentwhen their stock price falls. Most of the authors'evidence bearson the firstandthirdhypotheses. They have no sharp tests of the fourth hypothesis. They dismiss the second hypothesis-that managerslearn about the profitabilityof their investmentsfromthe stock market-because they believe thatmanagers have superiorinformationabout the profitabilityof their investments and describe evidence based on managers'stock tradingthat supports this belief. The authors'argumentsaboutmanagers'superiorknowledge of their firms' cash flows are convincing. Yet, even if managershave superiorknowledgeof the profitabilityof theirprojects,the marketmay still provideinformationuseful to them in makinginvestmentdecisions. Morck, Shleifer, and Vishny discuss stock returns as if they were governedonly by innovationsin currentandexpected futurecash flows. But stock returns also move with changes in the rates by which cash 3. Tobin and White (1981) note that Summers's (1981) estimates of a q-theoretic equation imply incrediblyhigh adjustmentcosts. Althoughthey make this point as a reductioad absurdumof models that link the stock marketand investmentonly through adjustmentcosts, many have taken this findingas impetusfor formulatingmore complicated, but still adjustment-costdriven,q-models. in terms of the q-theory, one should note that examiningthe growthof investmentis a perilousway to study the demandfor capital.Lawrence Summers, in his "Requiem for the Investment Equation," points out that having the level of investment as the left-hand-sidevariabledoes not make sense unless the right-handside controls for the deviation of the currentcapital stock from the desired level (as does the q-theory).4 Firmsdemanda stock of capital;investmentis merelythe regulationof that stock. Most investmentequationssin by slippinga derivative.The authors slip two derivatives by examining the growth in investment. Consequently,the authors'choice of specificationmakesit very difficult to interpretthe magnitudeof their estimated coefficient and makes it hardto believe thatthese coefficientsdo not varyacross firmsdepending on how actualcapitalstock departsfrom its desiredlevel. The authorsclaim that there is too muchfirm-levelheterogeneityfor them to model the relationshipin levels. Their inabilityto get sensible results in a levels specificationarises because they have omitted key factors, such as the stock of capital, from their analysis. Unless the omittedfactors are deterministictrends, differencingdoes not solve the specificationproblem. The authorsrun the reverse regression with the financingvariables on the left-handside to see how they are correlatedwith stock returns. One can see fromthe firstset of regressions(withinvestmentgrowthon the left-handside) that stock returnsand the financingvariablescannot be highly correlated. Includingthe financingfactors does not greatly affect the estimated sign of the stock return variable. Therefore, the authors could make their point without recourse to the second set of regressions. The authorspresent results at both the firmand the aggregatelevel. Their main equationhas investment growth as the dependentvariable and includes lagged stock returns,other variables(cash flow and sales) to capturethe fundamentaldeterminantsof stock returns,andstillothers (dummies for large new issues of equity and debt) to capture new financing.In the firm-levelregression, the stock returnis purgedof its correlation with the aggregate return. In these estimates, the stock marketis highly significantand has a large coefficient comparedto the aggregateestimates. When the fundamentalsvariablesare included in 4. Summers (1985). the regression,they are also very significantandhave importantexplanatory power. Their inclusion makes the coefficient on the stock return fall somewhat, but it is still large comparedto the aggregateestimates. Hence, the fundamentalfactors are importantin explaininginvestment, but leave a significantrole for the stock return.The financingfactorsare also significantin the regression.Theirinclusionleads only to a further small reductionin the coefficient of the stock returnsvariable, so the stock returnsand financingfactors are essentially independent. While the absence of the theoreticalmodel makes these results hard to interpret,it is possible to drawsome conclusions. The findingthatthe stock return is a significantexplanatoryfactor for investment, but is hardlya sufficientstatistic, is consistentwith the largebody of empirical work on q-theoreticinvestmentmodels. The significanceof the sales andcashflowvariablesis hardto interpret. Steven Fazzari, Glenn Hubbard,and Bruce Peterson include them in similarequations,but those authorsincludethem to show that liquidity affects investment. On the other hand, the present authors interpret these variablesas the fundamentaldeterminantsof stock values. Absent more information,both the Fazzari, Hubbard, and Peterson and the Morck, Shleifer, and Vishny explanationsof the correlationof investment and cash flow are consistent with the data.5 The significanceof the coefficients of the new equity and new debt dummy variables does not imply that financing causes investment. Suppose that the world is Modigliani-Milleron the margin,that is, that firmschoose a capital structurethat equates the marginalcost of funds across different types of financial claims. New investment must be financedby some means. On the margin,a firmshoulddesire to use all means;thus, it is not surprisingto see investmentcorrelatedwith both forms of financing.Therefore, the financing-investmentcorrelationis not evidence againstthe economic independenceof real decisions from financing decisions. The authorsabstractfrom aggregatemovementsin the stock market in their firm-levelregressionsby only includingthe idiosyncraticcomponent of stock returns and also by including year dummies in the regressions.Whileneglect of these aggregatecomponentsdoes not bias theirestimates, it does reducethe power of theirprocedure.Thereis no 5. Fazzari,Hubbard,andPeterson(1988). theoreticaljustificationfor abstractingfromthe aggregatecomponentof stock returns. By omitting this component, the authors reduce the potentialrole of theirreturnsvariable.Moreover,it wouldbe interesting to see how the aggregatecomponententers the regressions.They could either report the annualdummiesor, better, exclude them in favor of includingthe systematiccomponentof stock returns(the beta times the aggregatereturn).As notedearlier,managersshouldrespondto changes in the requiredrate of return,about which the aggregatemarketreturn carries an important signal.6 Consequently, by abstractingfrom the aggregate,the authorspotentiallyunderstatethe role of the stock market for investment.Doing so also makesit difficultto comparethe aggregate andfirm-levelresults. In the aggregateregressions, the stock markethas roughlythe same coefficientas the firm-levelregressionswhen the univariaterelationship is considered,butfalls dramaticallywhenthe fundamentalsareincluded. 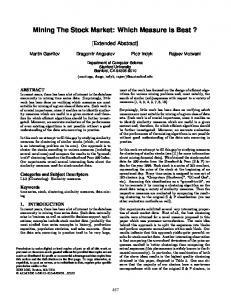 The text of the paper reads as if the stock marketexplains more in the aggregateregressionsthanthe firm-levelregressions.The authorscome to thisconclusionbecausethey relyinappropriatelyon theR2.Comparing R2's across samples is misleadingbecause the error variances are so differentat the firmand aggregatelevels. Indeed, as judged by the size and significance of the coefficient of the stock returns variable, the relationshipbetween investmentand the stock marketis muchlargerin the firm-levelregressions. James M. Poterba: Stock marketanomalies-the Januaryeffect, the weekendeffect, the alphabeteffect-are a favoritetopic of conversation at Brookings Panel meetings. If asked to justify these anomalies as legitimatesubjectsof macroeconomicinterest, most economists would argue that the stock marketprovides vital signals for investment and consumptiondecisions. An understandingof its movementsis therefore importantto an understandingof macroeconomicfluctuations. Inthisprovocativepaper,RandallMorck,AndreiShleifer,andRobert Vishny attemptto end these discussions. They argue that the conventionalview of the stock marketas an importantdeterminantof corporate 6. They shouldalso respondto firm-specificchangesin requiredratesof returncaused for exampleby changesin the risk-structureof theirreturns.These could be capturedby changes in the betas. Since the authorsassume them to be constant, these changes are includedin the estimatedalphas. investmentis misplaced.Drawingon a richbase of firm-levelinvestment dataandstockreturndata,the authorsarguethatto a firstapproximation, swings in the stock market are irrelevant forfirm investment decisions. The findings are significant not only because they illuminate what determinesinvestment,but also because they carrystrongimplications for the welfare cost of "noise trading" and other forces that cause transitorydivergences between asset prices and fundamentalvalues. This papersuggeststhat even if prices gyrateinappropriately,they may have little effect on real activity. The findingsin this papermay come as a surpriseto some subscribers to the q-theoryof investment, which links stock price and investment. Even withoutthis paper,however, a skeptic would have foundgrounds for concernregardingthe stock market'spredictivepower. JamesStock and Mark Watson's recent work on leading indicators finds that in predictingreal outputthe stock marketis dominatedby a collection of other variables. A twenty-year BPEA traditionof runninghorseraces between competinginvestmentequationshas shown that q-modelsare outpaced by equations including cash flow, output, and other flow measuresof corporateactivity.' The centralcontributionsof the currentpaperarethe use of firm-level datain studyingthe forecast power of the stock marketandthe focus on the incrementalexplanatorypower of the stock market. Althoughthe basic conclusions seem relativelyrobust,boththe choice of dataandthe statisticalanalysis in this paperinvite scrutiny. First, the timing convention in the regression equation excludes currentstock returns,but includes currentcash flow or sales. Since the fundamentalsare all dated later than the stock market variable, they have an informationaladvantage.This concern appliesboth to the firmlevel and aggregateestimates. However, results providedto me by the authorssuggest that this issue is not of criticalimportance:inclusionof the currentstock returnratherthan the lagged stock returnin the firmlevel equations actually reduces explanatorypower; in the aggregate equation, the current stock return enters with a negative coefficient. Thus, the timing convention is unlikely to be central to the empirical conclusion. 1. Sensenbrenner(1990) suggests that q- and neoclassicial acceleratormodels can performsimilarlyif a sufficientlyrichlag structureis considered. A second issue of specificationconcerns the use of time effects in the analysis of individualfirminvestment. Their use removes the effect of aggregate stock market movements, even though these may be an importantsource of the market'sexplanatorypower for each firm.One can easily imaginethat managersinvest more (given their firm's cash flow) when the stock marketoverall is high, signalingfuturegood times. Even if the broadmarketmovementswere uninformativefor investment of a givenfirm,the resultswouldbe farstrongerthanthe currentfindings. A thirddifficultyis that the paper does not performthe appropriate test of how stock returnsaffectinvestment.The idealtest wouldexamine the stock market's explanatory power at t - 1 after controlling for expectationsof futurefundamentalsthatwere formedby informationat t - 1. This would argue for development of a firm-levelor aggregate model to predictdividends. Then, the change in the optimalforecast of the present discountedvalue of dividendsshouldbe comparedwith the stock returnin forecastingfutureinvestment. A final concern is that the findings are sensitive to changes in specificationand sample period. Two other studies-those by Robert Barro and Olivier Blanchard,ChangyongRhee, and Lawrence Summers-that the authors cite estimate similar models with aggregate investmentdata.2Barroreports strongerevidence on the link between stock returns and investment than this paper finds. The difference between his results and those of the currentpaperis apparentlydue to his inclusion of lagged investment, and his somewhat longer sample period. Blanchard, Rhee, and Summers's paper uses a more formal methodologyto constructthe expected present value of dividendsand to contrastthe predictivepower of this series with the predictivepower of actual stock prices. Using this approach,they were not able to draw strongconclusionsaboutthe realeffects of sentiment-inducedswings in shareprices. Thus, I remainnervous that the currentfindings,particularlyin aggregatedata, are not definitive. Turningfrom data to statistical methods, I believe this paper also altersthe focus of priordebate. By concentratingon the stock market's incrementalexplanatorypower for investment spending, the authors shiftfrom the traditionalanalysis of q-investmentspending.It is important to distinguish,as the authorsdo, the claim that the stock marketis 2. Barro(1990);Blanchard,Rhee, andSummers(1990). are small,thereareotherchannelswhichmay be important.An example illustratesthis. If noise tradersraise the generallevel of requiredreturns in the equity market,these traderswill reduce the level of investmentin all periods, without regard to particular stock market movements. Exploringthese channelsis a naturaldirectionfor futurework. because of the crash may reflectthe fact that they had not revised it up in responseto the stock price boom in the firsthalf of 1987. Some panelistswere concernedthat the authorshad not paidenough attentionto the possible intertemporalrelationshipsamongthe variables andthereforemayhave underestimatedthe potentialinfluenceof market noise and given too much weight to fundamentals.Sims suggestedthat a positive signal could lead to an increase in sales contemporaneous with, or even leading, investment. To examine this issue, he suggested runningvector autoregressionsandlookingat the proportionof variance at varioushorizonsexplainedby stock marketinnovations. Lawrence Klein suggested testing for robustness, possibly by comparingestimatesfor differentsampleperiods.Since the noise component was so large in the cross-sectionalestimates, he conjecturedthat small changes in specification could lead to large changes in coefficient estimates. Gordonpointed out that the 1950s saw two big booms in the stock marketwith sluggishinvestmentandwonderedif the resultswould be robustto splits of the sampleinto pre- and post-1952periods. References Abel, Andrew B. 1979. Investment and the Value of Capital. New York: GarlandPublishing. Barro, Robert J. 1990. "The Stock Market and Investment." Review of Financial Studies 3: 115-32. Barsky, Robert, and J. BradfordDe Long. 1989. "Why Have Stock Prices Fluctuated? "HarvardUniversity (October). Black, Fischer. 1986. "Noise." Journal of Finance 41: 529-43. Blanchard,Olivier, ChangyongRhee, and Lawrence Summers. 1990. "The Stock Market, Profit and Investment." WorkingPaper 3370. Cambridge, Mass. : National Bureauof Economic Research (May). Bosworth, Barry. 1975. "The Stock Marketandthe Economy." BPEA, 2:1975, 257-90. Brainard,William C., and James Tobin. 1968. "Pitfalls in Financial Model Building." American Economic Review, Papers and Proceedings 56: 99122. Campbell,John Y., and Albert S. Kyle. 1988. "SmartMoney, Noise Trading and Stock Price Behavior." Technical Working Paper 71. Cambridge, Mass. : National Bureauof Economic Research (October). Cummins,Clint, BronwynH. Hall, Elizabeth S. Laderman,and Joy Mundy. 1988. "The R & D MasterFile Documentation. "TechnicalWorkingPaper 72. Cambridge,Mass. : NationalBureauof EconomicResearch(December). De Long, J. Bradford, and Andrei Shleifer. 1990. "The Bubble of 1929: Evidence from Closed-EndFunds." HarvardUniversity (May). De Long, J. Bradford,Andrei Shleifer, Lawrence H. Summers, and Robert J. Waldmann.1990. "Noise TraderRisk in FinancialMarkets. "Journal of Political Economy 98: 703-38. Fama, Eugene F. 1981. "Stock Returns,Real Activity, Inflationand Money." American Economic Review 71: 545-65. Fama, Eugene F., and KennethR. French. 1988. "Permanentand Temporary Componentsof Stock Prices." Journal of Political Economy 96: 246-73. Fazzari, Steven M., R. Glenn Hubbard, and Bruce C. Petersen. 1988. "FinancingConstraintsand CorporateInvestment." BPEA, 1:1988, 14195. Figlewski, Stephen. 1979. "Subjective Informationand MarketEfficiency in a Betting Market. "Journal of Political Economy 87: 75-88. Fischer, Stanley, andRobertC. Merton. 1984. "Macroeconomicsand Finance: The Role of the Stock Market." Carnegie-Rochester Conference Series on Public Policy 21: 57-108. Gordon, Robert J. 1986. "Introduction:Continuityand Change in Theory, Behavior,and Methodology. "In The American Business Cycle: Continuity and Change, edited by Robert J. Gordon. Chicago:University of Chicago Press, for NBER. Hayashi, Fumio. 1982. "Tobin's Marginalq and Average q: A Neoclassical Interpretation. "Econometrica 50: 213-24. Lee, Charles,AndreiShleifer, and RichardThaler. 1990. "Investor Sentiment andthe Closed-EndFundPuzzle." WorkingPaper3465.Cambridge,Mass. : National Bureauof Economic Research (October). Merton, Robert C. 1987. "A Simple Model of Capital Market Equilibrium with IncompleteInformation. "Journal of Finance 42: 483-510. Meyer,JohnR., and EdwinKuh. 1957. The Investment Decision: An Empirical Study. Cambridge,Mass. : HarvardUniversity Press. Poterba, James M., and Lawrence H. Summers. 1988. "Mean Reversion in Stock Prices: Evidence and Implications. "Journal of Financial Economics 22: 27-59. Sensenbrenner,Gabriel. 1990. "AggregateInvestment,the Stock Market,and the Q Model: Robust Results for Six OECD Countries." Northwestern University (July). Seyhun, H. Nejat. 1986. "Insiders' Profits, Costs of Trading, and Market Efficiency." Journal of Financial Economics 16: 189-212. . 1988. "The Information Content of Aggregate Insider Trading." Journal of Business 61: 1-24. . 1990. "Overreactionor Fundamentals:Some Lessons from Insiders' Response to the MarketCrashof 1987." Journal of Finance 45: 1363-78. Shiller, RobertJ. 1981. "Do Stock Prices Move Too Much to Be Justifiedby SubsequentChangesin Dividends? "American Economic Review 71: 42136. 1984. "Stock Prices and Social Dynamics." BPEA, 2:1984, 457-98. 1987. "Investor Behavior in the October 1987 Stock Market Crash: Survey Evidence." Working Paper 2446. Cambridge, Mass. : National Bureauof Economic Research (November). Shleifer, Andrei, and Vishny, Robert W. 1990. "EquilibriumShort Horizons of Investors and Firms." American Economic Review, Papers and Proceedings 80: 148-53. Stein, JeremyC. 1988. "TakeoverThreatsand ManagerialMyopia." Journal of Political Economy 96: 61-80. Stock, James H., and MarkW. Watson. 1990. "Business Cycle Propertiesof Selected U.S. Economic Time Series, 1959-1988." WorkingPaper 3376. Cambridge,Mass. : National Bureauof Economic Research (June). Summers, Lawrence H. 1981. "Taxation and Corporate Investment: A qTheory Approach. "BPEA, 1:1981, 67-127. . 1985. "Requiem for the Investment Equation." Remarks presented at Conferenceon Impactof Taxationon Business Activity. Ottawa,Canada, November 12-13. Tobin, James, and Philip M. White. 1981. "Discussion." BPEA, 1:1981, 13239. Zweig, Martin E. 1973. "An Investor Expectations Stock Price Predictive Model Using Closed-EndFund Premiums. "Journal of Finance 28: 67-78. Report "The Stock Market and Investment: Is the Market a ... - CiteSeerX"